What caused the planets to spin in the first place? Why do some spin in a reverse direction. My 2 cents worth: The origin of all spin is the same. Suggest watch Perratt's video simulation of 2 parallel currents attracting. As they get close, they do not collide, but wind around each other, forming the well-known helical pattern. Any mass in the way gets swept up and is set spinning. Doesn't matter whether it eventually forms a galaxy, a star or a planet, it still gets spin. Reverse spins come about through catastrophes and 'cosmic billiards'. IMHO. Reverse spins come about through catastrophes and 'cosmic billiards'. And, reversal of (electro-static) charge, imo. The North Pole is always stronger then the South Pole. Therefore one Pole always chases the other. The Dual Magnetic Vortex of The Secret World Of Magnets is very important. Also take a look at magnetic fields in motion. Since they always talk about Magnetic Fields of Planetary Bodies in Gravity only Cosmology, one should become aware of the Dual Vortex and the forces at work in Magnetic Fields. Yes the E Field that creates it is what the EU is all about, but the true Nature of Magnetic Fields in and of itself is not known by the public. I mean to set that record straight for this forum. All known forces are symmetrical in nature, in that for every action, there is an equal and opposite reaction. This symmetry we are taught that is universal and applies to everything including magnets. That not true, either one of those Ideas. Iron Filings show you NOTHING of the true nature of a dynamic magnetic field. They merely become little magnets themself in the Dynamic Magnetic Field. Magnetic Poles are not equal. These two misconceptions are hiding huge truths. The 3-D and 4-D Magnetic Dual Vortex is something you cannot afford not to learn. Since I started to do visualization of interacting and opposing vortices in my mind, conceptualisation went up 50%. And that is thanks to my researches on magnetic motors. A magnet is: imbalanced forces in a balanced system. On the North magnetic pole of a magnet, the North vortex is at 100% and the South vortex at about 80%. On the South magnetic pole of a magnet, the South vortex is at about 120% and the North vortex at 100%. This create a warp sphere of influence on the sides of the magnets and in the overall form of the vortex structures. The reentry points of the magnetic vortices are possibly not in the center of the physical magnet. They may be displaced by as much as a ratio of 60/40. If you learn this information and how to derive EM by the original 20 Quaternions of Maxwells EM Thesis, you will totally be able to take the next step to derive all Spin Domains. This will allow you to be a master of Spin. The work of both Maxwell and Faraday are very clear. The EM field is a Mechanical Field. It is a EM Gyroscope. All the rules of EM relationships are due to the mechanical relationships of Gyroscopes to induced pressure. And who says a COMPLETE revolution is 360 degrees? Suppose a complete revolution was actually 720 degrees, which would be more in line with the asymptotic dimensional dynamics of quantum physics. Can you detect the corresponding principles involved in spin and velocity as they relate to matter and anti-matter? Imagine a sine wave itself, behaving within a traveling sine wave creating rift polarities from which dimensional energies find similarities within our environment, and express themselves accordingly. This requires a pump. This requires a Gforce. APM has measured this Gforce via the Quantum Constants. This is the cause of all Spin at all Levels. Spin is a harmonic of PHI at all levels. The traditional protoplanetary clouds model is also wrong for further reasons. For example the anglular momentum of the Sun is not explainable in comparison to that of the planets, very more quick. This excess of anglular momentum is not explainable according to the proprlyd theory, unless put complex hypotheses ad hoc. But, it is well known that all the stars up to the class F5 have a low anglular momentun as that solar. While the other classes A, B, and O have it very high, with or without orbitting planets. This seem me be a big problem to resolve, for the protoplanetary clouds model. The Spin of Space link was a mind opener into quantum 4-D. The Quantum Spin Cycle reveals everything! The Axis is as important a cycle as the Equator. A 360 spin is only 1/2 quantum. Because the Axis is only 180!!!!!!! Because then the Axis is 360. This spin relationship draws out a Tetrahedron. Now I know why the Earth Spins on its Axis by determined harmonic cycles. When you spin clockwise, the rest of the world spins counterclockwise. There are at the very miniumum two sides to every spin as all spins relate. Unity is plural and at miniumum two. Eres, here is an article that claims the Sun's 'missing' angular momentum is found if the Sun is in a 24,000 year orbit (a binary star system). See Figures 3 and 4. Having no formal background in electrical science, I was wondering exactly what electrical phenomena might be responsible for the highly stable planetary orbits around the sun. First of all, I agree with EU theory that gravity alone cannot be responsible for the high stability of the planetary orbits. I have always felt uncomfortable with the gravity theory, despite claims by the conventional scientific community. For example, slight gravitational influences from the moon and other planets will inevitably modify Earth's orbit, which will end its orbital stability as it falls toward the sun or escapes into the outer reaches of the solar system after only a few million revolutions around the sun... this would either fry or freeze the surface of the Earth, rendering biological life impossible. However, after reading Mr. Thornhill's electrical explanations for the orbital stability of planets, I can sense some reality behind it, but cannot fully understand its reasoning. So my question is this: As a planet orbits the sun, or as a moon orbits its mother planet, what prevents the orbiting object from moving too close or too far away from the central object being orbitted? In other words, the distance from the central object to the orbiting object at any moment in time seems to be maintained within a narrow range. I understand the concept of electrical discharge between two bodies. And I will temporarily accept Thornhill's theory that a decrease in charge results in decrease in gravitational mass, for the sake of this discussion. But if the Earth suddenly moves too close to the sun, will there be an electrical discharge between the sun and the Earth, and why? I would appreciate any comments. Re: Why Are Planetary Orbits So Stable? htert2020, With reference to your question about what happens if Earth got closer to the Sun; Imagine you were the Sun and your cat the Earth. On a dry day, stroke the cat, or rub your feet on the carpet, to charge your capacitance. Now, touch the cat's nose with your finger. Snap! (watch for flying claws). This charge equalization is the same, but much smaller-magnitude reaction. Is there experimental evidence that connects charge to mass? 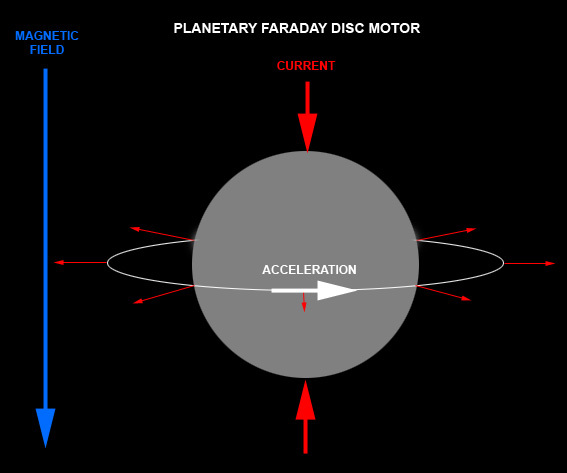 My take on planetary disk motor activity is somewhat different that what is shown in the diagram. I am thinking that a Birkeland current flows from somewhere in space, enters Earth's rotational south pole (not magnetic pole), travels through the rotational axis of Earth, then exits through the rotational north pole. As the current travels through the rotational axis, it generates a magnetic field that encircles the axis in the direction of west to east. In 3D, this magnetic field would look like concentric cylinders around the Earth's axis with encircling arrows flowing from west to east. The magnetic field is strongest near the Earth's axis; it becomes progressively weaker as you travel farther from the axis. By the time you get to the outer magnetosphere, the field is very weak and almost unnoticeable. The magnetosphere itself would be generated by another source, which I will explain. Near the core of the Earth would be solid matter that responds to the magnetic fields of the axis-centered concentric cylinders. The magnetic field arrows -- let's call them "vectors" -- push the solid matter in the direction going from west to east. Because the solid matter is physically connected to other parts of the Earth, the whole Earth experiences a rotational acceleration force going from west to east. This rotational acceleration force need not be very large; it only needs to maintain the Earth's already-existing angular momentum which would otherwise diminish through friction with interplanetary plasma. Meanwhile, the plasma ionosphere and other plasma layers of the upper atmosphere of Earth also rotate along with the Earth. This is where my understanding and mental model of the situation gets highly speculative and unclear, but let's say that there are some significant negatively-charged entities either in the plasma layers, just below the surface of the Earth, or even far below the surface of the Earth. Those negatively-charged entities are moving with an angular momentum around the rotational axis of the Earth. Since the movement of any charged object always creates a magnetic field, these negatively-charged entities encircling the rotational axis of Earth create a secondary magnetic field. Since they are going from west to east, the "right-hand rule" in physics suggests that the secondary magnetic field would flow from north to south around the outside of the surface of the Earth. The negatively-charged entities would be uniformly distributed throughout the 3D circumference of the Earth so that the secondary magnetic field would be uniform all the way from the magnetic north pole (not rotational north pole) to the magnetic south pole. This secondary magnetic field would be the Earth's magnetosphere. Although this model represents my best understanding of the situation, there are serious questions associated with it. For example, why do the magnetic poles invert every few tens of thousands of years? This cannot be explained by the rotational axis current switching direction, for that would either decelerate or reverse the direction of rotation of the Earth, and the rotational acceleration force would then be in the east-to-west direction. Yes, this model has serious problems, but it's the best and least-contradictory model that I can come up with. Perhaps someone here might have some new facts that can cast some new light on this. I have a lot of serious questions about the EU model of planetary rotation, but the EU model sure makes more sense than the outdated gravitational, Big Bang, and nuclear fusion models of mainstream. Osmosis wrote: On a dry day, stroke the cat, or rub your feet on the carpet, to charge your capacitance. Now, touch the cat's nose with your finger. Yes, this would explain why there might be an electrical discharge between the sun and the Earth if the Earth ever got naughty enough to come closer to the sun. What I am unclear about is why such an electrical discharge would create a physical force upon the Earth to retreat back to its original distance from the sun. Also, there might not be a discharge directly from the sun to the Earth. The Earth is approximately 93 million miles from the sun. The interplanetary plasma at 87 million miles, for example, would already have a significant charge difference with the Earth, and that could cause a discharge between that area of plasma and the Earth. I am assuming that the entire solar system is bathed in low-density plasma where the positive charge of the plasma steadily increases as you get closer to the sun. But my main question remains as to what prevents Earth from falling into the sun or wandering into the outer reaches of the solar system, even after making millions or supposedly billions of revolutions around the sun. I'd bet it's more of an electrical phenomenon than a gravitational one. But I don't have an exact explanation. Until we (the human race) figure this out, we can never fully explain why the planetary orbits are so stable. Interesting topic; just a few thoughts. Under gravity alone, a 2-body system is stable. A 3-body system is unstable [chaotic]. A 9-body [or more] system like the solar system is wildly unstable. By rights we should be all over the place. Clearly another force is acting to give us the present stability, and indeed if Venus sprang from the brow of Zeus recently, it achieved that stability very quickly and is therefore quite powerful. I like the idea that the magnetotail of one planet bumps the magnetosphere of the next planet out, thus maintaining a constant distance and so on. Apparently there is some evidence for this. When the earth's magnetotail passes across the moon, it raises dust. When the earth's magnetotail passes across Mars, it triggers duststorms. I wonder what happens when Venus's magnetotail [if it's got one] passes across Earth. Venus has one and it's been shown to be larger than expected. I would suspect the magnetosphere of the earth would deflect this more so as opposed to earth's moon or mars due to the lack thereof.